Seek shade from 10 am to 4 pm because that’s when the sun’s rays are strongest. Wear protective clothing, a hat to shield your face and sunglasses. Regularly apply sunscreen with a sun protection factor (SPF) of at least 30, even on cloudy days, and reapply every two hours. Use an insect repellent that contains DEET and check for ticks regularly. If you notice a bull’s-eye rash or mark, see a doctor immediately, as this is a sign of Lyme disease. Drink fluids, mainly water, especially on hot days. Symptoms of dehydration include decreased urine output, dry mouth, sunken eyes and fatigue. Swim in areas monitored by lifeguards, and supervise children even with a lifeguard present. Use the buddy system: It is safer and more fun to swim with a buddy. Teach your children that they need your permission to go near water. 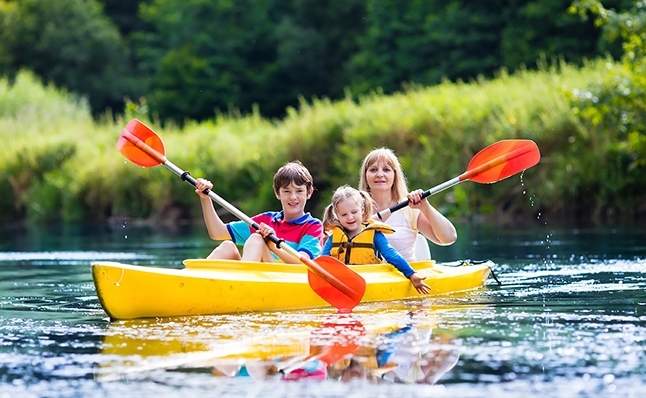 Inexperienced swimmers should wear a life jacket when near or in the water. Never approach wild animals – stay 100 yards or more away from wildlife. Don’t veer off dedicated trails or paths to help avoid dangers such as hot springs, wildlife or poisonous plants. Don’t feed the wildlife because they will become reliant on human food and become more aggressive when they see humans. Never enter restricted areas of a park, for your safety and the safety of park employees. Know your limits. Don’t go on rides that may cause you to become ill.
Keep your head up and your eye on children at all times so they don’t get lost in the crowd. Always supervise your climbers and swingers. Avoid playgrounds that have broken equipment or unsafe surfaces like asphalt. Separate big children from little children because bigger children can play more aggressively. Make sure vaccinations (e.g., tetanus or hepatitis A) are up to date. Wash or sanitize hands frequently. Keep food safe by keeping raw foods separated and by having everything chilled to proper temperatures. UCLA pediatricians can answer your questions and ensure your children’s vaccinations are current. Find a provider or call 310-825-2631 to make an appointment. The article is truly informative. All the tips shared above are helpful to keep kid's eyes safe.